Malignant features—such as sustained proliferation, refractoriness to growth suppressors, resistance to cell death or aberrant motility, and metastasis—can be triggered by a variety of mutations and signaling adaptations. Signaling nodes can act as cancer-associated factors by cooperating with oncogene-governed pathways or participating in compensatory transduction networks to strengthen tumor properties. G-protein–coupled receptor kinase 2 (GRK2) is arising as one of such nodes. Via its complex network of connections with other cellular proteins, GRK2 contributes to the modulation of basic cellular functions—such as cell proliferation, survival, or motility—and is involved in metabolic homeostasis, inflammation, or angiogenic processes. Moreover, altered GRK2 levels are starting to be reported in different tumoral contexts and shown to promote breast tumorigenesis or to trigger the tumoral angiogenic switch. The ability to modulate several of the hallmarks of cancer puts forward GRK2 as an oncomodifier, able to modulate carcinogenesis in a cell-type specific way. Cancer is caused by sequential genetic and epigenetic alterations that disrupt the regulatory circuits governing normal cell proliferation and homeostasis. This multistep pathologic process involves the progressive occurrence of molecular modifications and cellular adaptations by selective pressure over many years, which leads to considerable heterogeneity and variability among tumors; however, most tumors share essential alterations in cell physiology, which together promote malignant transformation and are termed the hallmarks of cancer (Hanahan and Weinberg, 2011). These hallmarks include maintained proliferative signaling, insensitivity to growth-inhibitory signals, resistance to cell death, limitless replicative potential, induction of angiogenesis, tissue invasion and metastasis, metabolic reprogramming, and evading immune response. In addition, two transversal characteristics are permissive for the acquisition of these tumoral traits: development of genomic instability and the chronic inflammation linked to premalignant and tumoral lesions. Indeed, contributions of nontumoral components (extracellular matrix, fibroblasts, resident immune cell types, or vascular cells) are keys to cancer progression, and the interactions in the tumor microenvironment play an increasingly important role in tumor biology. Oncogene-driven proliferation and survival of tumor cells are assisted by various mechanisms. Cells can secrete their own growth factors (GF) or stimulate their release by cells within the stroma (Bhowmick et al., 2004). Alternatively, GF receptors can also be mutated or overexpressed, rendering cells hyper-responsive even to limited amounts of these ligands. Constitutive activation of signaling components (kinases, G-protein switches, transcription factors) operating downstream to these receptors may also drive GF-independent proliferation (Hanahan and Weinberg, 2011) and are common targets for oncogenic transformation. In addition, other nongenetically altered factors can cooperate with oncogenic routes or trigger compensatory pathways to strengthen tumoral properties or to cope with intrinsic tumor vulnerabilities. Regulatory molecular nodes able to integrate multiple upstream inputs and trigger diverse downstream outputs are particularly suitable to act as nononcogenic contributors to malignant transformation and progression. In this context, G-protein–coupled receptor kinase2 (GRK2) is emerging as a potentially relevant oncomodulator given its functional connections with the most relevant signaling networks required for the proper function, homeostasis, and viability of the cell. In this review, we recapitulate the results linking GRK2 to several pathways related to the hallmarks of cancer (Fig. 1) and emerging evidence pointing to a role for this kinase in the progression of specific tumors. GRK2 modulates multiple processes related to the hallmarks of cancer. Overview of the diverse GRK2 “interactomes” (either scaffold- or kinase-activity–dependent) integrated in pathways controlling the hallmarks of cancer. See text for detailed discussion. G-protein–coupled receptor kinases (GRKs) were first described as negative GPCR (G-protein-coupled receptors) modulators. Agonist-occupied GPCR become specifically phosphorylated by these kinases (Gurevich et al., 2012), thus allowing the recruitment of β-arrestins, leading to uncoupling from G-proteins and GPCR internalization; however, arrestins are scaffold proteins for several signaling mediators, eliciting additional signaling pathways from GPCR signalosomes (Shenoy and Lefkowitz, 2011). Therefore, changes in GRK functionality could also influence the balance/bias between the G-protein–dependent and GRK/β-arrestin-branches of GPCR signaling and the recruitment of arrestin interactors (Penela et al., 2010a). GRK2 is a ubiquitous member of the GRK family. Global GRK2 knockout mice are the only among the GRK family that are embryonically lethal, indicating a critical role in core cellular processes. Consistently, research in different laboratories has shown that GRK2 can also participate in signaling networks by directly interacting and/or phosphorylating non-GPCR cellular partners (Penela et al., 2010a; Evron et al., 2012; Gurevich et al., 2012), including receptor-tyrosine kinases and a variety of cytosolic or nuclear signaling proteins (see the following section). A main challenge is to gain further insight about how these varied canonical and noncanonical GRK2 functions integrate in specific cell types and contexts and at the organism level and to discern whether the GRK2 signaling hub can be altered and contribute to disease progression in cancer or other pathologic conditions. The potential mechanisms by which GRK2 may participate in the pathways controlling the hallmarks of cancer are summarized in the following sections. Changes in GRK2 levels or functionality have been reported to affect mitogen-activated protein kinase (MAPK)/ERK activation and cell proliferation in different ways, depending on the cell type and mitogen stimuli involved. The mechanisms underlying such effects can be varied, including “canonical” desensitization of G-protein–dependent MAPK stimulation by GPCR, modulation of GPCR-β-arrestin-MAPK cascades or of GPCR crosstalk with epidermal growth factor receptor (EGFR) or other GF receptors (Filardo et al., 2008; Sosa et al., 2010). In addition, GRK2 is able to phosphorylate and/or interact with relevant components of the MAPK pathway downstream the stimulation of GF receptors or of mitogenic GPCRs, such as GRK interactor 1(GIT-1), RhoA, exchange factor directly activated by cAMP, phosphodiesterase-γ, Raf kinase inhibitor protein, or peptidyl-prolyl cis-trans isomerase NIMA-interacting 1(Pin1) (Wan et al., 2003; Penela et al., 2008, 2010b; Deiss et al., 2012; Robinson and Pitcher, 2013; Singhmar et al., 2016). GRK2 promotes MAPK activation and/or cell proliferation triggered by some tumor-related GPCRs. In epithelial cells, GRK2 potentiates MAPK stimulation by the lipid sphingosine-1-phosphate (S1P1) receptor by associating to GIT-1 (Penela et al., 2008), whereas it fosters β-arrestin-MAPK activation by the chemokine receptor C-X-C chemokine receptor (CXCR) type 7 in astrocytes (Lipfert et al., 2013). GRK2 also potentiates hedgehog-/smoothened-mediated transformation in fibroblast cell lines (Meloni et al., 2006; Zhao et al., 2016). In this context, the stimulatory effect of GRK2 in cell proliferation during early embryonic development involves the interaction of GRK2 with patched, thus relieving the patched-induced cytosolic retention of cyclin B in response to hedgehog (Jiang et al., 2009). In addition, GRK2 enhances MAPK signaling in response to integrins in epithelial cells and fibroblasts (Penela et al., 2008) and to EGF in HEK-293 cells (Wan et al., 2003), vascular smooth muscles cells (Robinson and Pitcher, 2013), or epithelial cells (Penela et al., 2012; Nogués et al., 2016). IGF-1-triggered proliferation and mitogenic signaling in osteoblasts is dependent on GRK2 kinase activity (Bliziotes et al., 2000). Conversely, GRK2 weakens serum- or platelet-derived growth factor–induced proliferation of thyroid cancer (Métayé et al., 2008) and smooth muscle cells (Peppel et al., 2000), as well as insulin growth factor 1 (IGF1)-dependent proliferation of human hepatocellular carcinoma (HCC) (Wei et al., 2013) or human embryonic kidney cell line 293 (HEK-293) cells (Zheng et al., 2012; Fu et al., 2013) likely via desensitizing phosphorylation of these GF receptors. The reported functional interaction of GRK2 with several proteins involved in the cellular response to stress, including p53, p38, Smad2/3, AKT (protein kinase B, PKB), Hsp90, or histone deacetylase 6 (HDAC6) (reviewed in Penela et al., 2010a; Lafarga et al., 2012), might modulate cell survival and resistance to apoptosis in certain contexts. GRK2 accumulates in the presence of DNA damaging agents that activate cell-cycle arrest, for example, doxorubicin, thus contributing to counterbalance the stimulation of the p53 pathway elicited by G2/M checkpoint mechanisms and preventing apoptosis of arrested cells (Penela et al., 2010b). Depending on the cell type and pathologic context, p38, which can either promote apoptosis or survival, is phosphorylated by GRK2, which prevents binding of upstream activators and certain substrates (Peregrin et al., 2006). In endothelial cells,GRK2 has been reported to inhibit Akt via direct association between these kinases (Liu et al., 2005; Horinouchi et al., 2016), whereas a positive effect of GRK2 on this pathway via PI3kγ interaction has been shown in cardiomyocytes (Perrino et al., 2007). Upon stimulation of the ALK5 receptor by transforming growth factor β (TGFβ), GRK2 binds to and phosphorylate Smad2/3, preventing the nuclear shuttling of the Smad complex and thus hindering proapoptotic TGFβ effects and potentially enhancing its tumor-promoting role (Ho et al., 2005, 2007). GRK2 plays an important role in the migration of different cell types (reviewed in Penela et al., 2014). GRK2 has been shown to trigger desensitization of a variety of chemokine receptors, therefore finely tuning chemokine-dependent signaling in lymphocytes and neutrophils during inflammation (Vroon et al., 2006). Similarly, mobilization of macrophages to CCL5 is enhanced in GRK2 hemizygous mice, and LPS reportedly favors CCL2-induced macrophage migration by decreasing GRK2 levels and therefore avoiding CCR2 receptor desensitization (Liu et al., 2013; Otten et al., 2013; Rivas et al., 2014). In particular contexts, however, GRK2 downmodulation can show opposite effects in the migration of certain types of immune cell types to specific stimuli (Arnon et al., 2011). On the other hand, GRK2 is a positive player in epithelial cell migration via different mechanisms. GRK2 phosphorylates ezrin and radixin, fostering its ability to modulate actin remodeling, migration, and invasion (Cant and Pitcher, 2005; Kahsai et al., 2010). GRK2 can also trigger polarity persistence in the presence of chemotactic messengers and integrins by increasing the intensity and duration of MAPK stimulation and the turnover of focal adhesions via the GIT-1 hub (Penela et al., 2008). GIT-1 is a multidomain protein able to scaffold different partners involved in cell migration at focal adhesions and the cell’s leading edge, resulting in localized MAPK and Rac/ p21-activated kinase stimulation (Hoefen and Berk, 2006). In response to either fibronectin or S1P, GRK2 associates with GIT-1 at the leading edge, fostering GIT-1–dependent stimulation of Rac1, F-actin cortical remodeling, and MAPK, leading to increased migration (Penela et al., 2008). Finally, GRK2 is able to control microtubule dynamics through the activation of HDAC6 (Lafarga et al., 2012). HDAC6 is a cytosolic histone deacetylase type that is overexpressed in a high proportion of breast cancers and other type of tumors and reported to modulate cell growth, motility, and invasion by allowing dynamic acetylation-deacetylation of cortactin or tubulin, among other substrates (Duong et al., 2008; Lee et al., 2008; Aldana-Masangkay and Sakamoto, 2011). In response to EGF, GRK2 associates with and phosphorylates HDAC6, which enhances its α-tubulin deacetylase activity, thus resulting in local tubulin deacetylation at the leading edge of migrating cells and enhanced motility (Lafarga et al., 2012). Notably, the ability of GRK2 to phosphorylate HDAC6 relies on the previous phosphorylation of GRK2 at S670 by MAPK in response to external stimuli. S670-GRK2 phosphorylation would simultaneously disrupt its interactions with competing cellular partners such as GPCR or GIT-1 while turning on the modulation of HDAC6 at defined locations within the cell. The dynamic modulation of the phosphorylation status and subcellular localization of GRK2 by specific stimuli would thus allow rapid switching of interacting partners, allowing the concerted action of GIT-1 signalosomes and of deacetylated MTs in cortical polarity and membrane protrusion (Penela et al., 2014). Notably, a number of the GRK2 partners discussed here are important players in tumor cell invasion, including plasma membrane GPCRs (for ligands as S1P, chemokines, or proteases), integrins, or EGF receptors and cytoskeleton modulators such as RhoA, Rac1, or Ezrin-Radixin-Moesin. Other potential GRK2 targets, such as the chemokine receptors CXCR4 and CXCR7, are highly expressed in a range of tumors and play a role in metastasis, although their role in cancer progression is not fully understood. CXCL12, the CXCR4 ligand, is constitutively expressed at tumor and metastatic sites (O’Hayre et al., 2014). CXCR7 also binds CXCL12 and triggers downstream pathways in a G-protein–independent manner and/or by scavenging CXCL12 away from CXCR4. Whether changes in GRK2 dosage taking place during cancer progression can modify signaling/migration/invasion/angiogenesis mediated by the CXCL12/CXCR4/CXCR7 axis or by other chemokines present in the tumor microenvironment is an interesting avenue for future research. Important metabolic changes/adaptations take place in different cell types during cancer progression as a result of fluctuations in oxygen or nutrient availability, altered mitochondrial function and redox status, modulation of autophagy and proteostasis, rewiring of proliferation or differentiation networks or modifications of the microenvironment (Lehuédé et al., 2016). On the other hand, epidemiologic data suggest that patients with insulin resistance/obesity have a higher risk of developing several types of cancer (Klil-Drori et al., 2016). In addition to desensitizing GPCR controlling metabolic rate and energy expenditure, such as adrenergic receptors (Vila-Bedmar et al., 2012), GRK2 has emerged as an important player in insulin resistance and obesity and in mitochondrial function (Ciccarelli et al., 2012; Vila-Bedmar et al., 2015; Hullmann et al., 2016). GRK2 acts as a negative modulator of insulin cascades by either interfering with insulin-Gq/11 signaling leading to GLUT4 translocation (Usui et al., 2004) or by interacting and/or phosphorylating insulin receptor substrate 1(Garcia-Guerra et al., 2010; Ciccarelli et al., 2011). Moreover, GRK2 levels are elevated during insulin resistance in several tissues in high-fat diet murine models (Garcia-Guerra et al., 2010; Lucas et al., 2014). Decreasing kinase levels can prevent and reverse development of insulin resistance and obesity phenotype in vivo (Vila-Bedmar et al., 2015). In addition, in stressed cardiac cells, GRK2 can localize to the mitochondria upon ERK1/2 GRK2 phosphorylation and subsequent complex formation with Hsp90. Although a protective effect has been suggested (increased biogenesis and ATP production) (Fusco et al., 2012), others have reported that mitochondrial GRK2 displays a detrimental effect by increasing superoxide levels and altering substrate utilization for energy production (Chen et al., 2013; Sato et al., 2015; Cannavo et al., 2016). Whether changes in GRK2 levels/activity taking place in tumor cells can modulate metabolic networks or mitochondrial functions is an interesting issue for future research. Tumor microvasculature is usually highly angiogenic and leaky, displaying enlarged and dilated vessels lined with immature walls due to the loss of pericytes, leading to deficient blood supply. Subsequent hypoxia prompts secretion of different proangiogenic and proinflammatory factors, perpetuating aberrant vascularization and inflammation (Potente et al., 2011). In such microenvironment, reciprocal interactions among tumor-associated vasculature, tumor-infiltrated immune cells, and transformed cells drive cancer progression. GRK2 is emerging as a signaling node integrating several pathways involved in endothelial cell activation and maturation, such as those mediated by S1P, vascular endothelial GF, platelet-derived growth factor-BB, and TGFβ1 receptors. Upon GRK2 downmodulation, the response of endothelial cells (ECs) to relevant angiogenic stimuli (vascular endothelial GF, S1P, serum) is increased, altering the capability of these cells to organize into tubular structures, as well as disrupting the balance in the secretion of inflammatory and angiogenic factors. Moreover, decreased GRK2 levels also modify TGF-β signaling, which controls both the activation and resolution phases of angiogenesis via the timely modulation of the opposite effects of ALK1 and ALK5 receptors (Rivas et al., 2013, 2014). Consistent with such impacts on endothelial cell signaling, GRK2 loss impedes ECs differentiation and fusion into tubular structures and hampers the recruitment of pericytes, leading to immature and leaky vessels (Rivas et al., 2013). Remarkably, EC cell-specific GRK2 silencing fosters the growth of tumors in mice. The vessels of tumors developed in these animals display increased size and reduced pericyte recruitment, key features of the tumor microvasculature. Notably, endothelial GRK2 dosage is indeed downregulated in human breast cancer vessels (Rivas et al., 2013). Whether such tumor cell-driven endothelial cell GRK2 downmodulation applies to different types of cancer and the molecular mechanisms involved remain to be established. Endothelium-specific downmodulation of GRK2 also appears to promote the recruitment of macrophages to the tumor directly by altering the chemotactic secretome of ECs and indirectly by promoting leaky vessels, leading to a gradient of hypoxia-induced chemoattractants for myeloid cells (Rivas et al., 2013). Since GRK2 is a well-established modulator of chemokine receptors in immune cells in human inflammatory diseases (Vroon et al., 2006), it is tempting to speculate that changes in GRK2 levels might modulate tumor homing and outcome of tumor progression of cancer types related to inflammatory conditions (Coussens and Werb, 2002); however, whether such changes take place in the context of cancer has not been addressed. Despite the potential relationship of GRK2 with many of the processes and hallmarks of cancer discussed herein, a comprehensive study of changes in its function or levels in specific tumoral contexts and on the role of GRK2 in tumor formation and progression has only recently started to be addressed (Fig. 2). Changes in GRK2 expression/activity in specific tumors. (A) Schematic representation of the tumor types where altered GRK2 expression has been reported. Experimental approaches and references are indicated. (B) Available evidence supporting a role for altered GRK2 levels in tumor progression. Experimental models: the cell type is targeted to alter GRK2 expression or activity; its overall impact on tumorigenesis and relevant references are indicated. See text for details. It should be noted that GRK2 functionality and protein expression are regulated at multiple levels (Ribas et al., 2007; Penela et al., 2010a), so the interpretation of the absence of changes in the GRK2/ADRBK1 gene in more widely available cancer-related mRNA databases is not straightforward. Altered protein levels of GRKs that are not paralleled by corresponding changes in mRNA levels have been noted in several pathologic conditions, including chronic inflammatory processes (Lombardi et al., 2002), hypothyroidism, or different tumoral contexts such as in differentiated thyroid carcinoma or ovarian cancer (Métayé et al., 2002; King et al., 2003; Penela et al., 2010a). GRK2 protein interacts with different regulators such as Hsp90 or caveolin, and it undergoes different types of post-translational modifications (reviewed in Ribas et al., 2007). Kinases frequently altered in tumoral contexts such as the tyrosine kinase c-Src or MAPK/ERK1-2 can modulate GRK2 function. Tyrosine-phosphorylated GRK2 displays an enhanced catalytic activity toward both GPCR and non-GPCR substrates (Sarnago et al., 1999), whereas modification at S670 by ERK1-2 causes a switch in the repertoire of kinase substrates and interactors, allowing phosphorylation of HDAC6 (Lafarga et al., 2012) while disrupting its interaction with GPCR or GIT-1 (Elorza et al., 2000; Penela et al., 2008). Phosphorylation also has also direct effects on the modulation of GRK2 stability by the proteasome pathway (Penela et al., 1998). Both c-Src- and MAPK-dependent phosphorylation of GRK2 underlies GPCR-induced GRK2 degradation, which involves the Mdm2 E3-ubiquitin ligase (Penela et al., 2001; Elorza et al., 2003). Arrestins appear to play a coordinating role in recruiting kinases and/or ubiquitin ligases to GRK2 in the basal condition or upon activation of GPCRs, regulating GRK2 turnover via different pathways (Nogués et al., 2011). Interestingly, activation of the PI3K/Akt pathway by IGF-1-triggered receptor-tyrosine kinases alters the Mdm2 phosphorylation pattern and promotes its nuclear shuttling, thus hindering Mdm2-mediated GRK2 ubiquitination, leading to boosted GRK2 protein levels (Salcedo et al., 2006), suggesting that in some tumoral contexts the increase in GRK2 expression might be concurrent with a higher activity of this ligase. Recent data from our laboratory indicate a relevant oncomodulator role for GRK2 in breast tumorigenesis (Nogués et al., 2016). Elevated GRK2 protein levels are present in different breast cancer cell lines, in spontaneous mice mammary tumors, and in a significant proportion of invasive ductal carcinoma patients. The stimulation of estrogen or EGFR receptors, the Ras-HER2, and the PI3K-AKT cascades, known to be hyperactivated in luminal and in certain nonluminal types of breast cancer (Eroles et al., 2012), converge in promoting enhanced GRK2 expression in transformed breast epithelial cells, likely via enhanced stimulation of the AKT pathway (Nogués et al., 2016). Cancer cells, in which GRK2 is enhanced, display genetic alterations in this pathway (PI3KCA, PTEN) or hyperstimulation of receptors (EGFR, HER2, ER) able to trigger AKT stimulation, which in turn would stabilize GRK2 protein by hampering Mdm2-mediated GRK2 proteasome degradation (Salcedo et al., 2006). Augmented GRK2 levels play a driving role in the acquisition of oncogenic features by both luminal and basal breast cancer cells. GRK2 upregulation leads to a reinforcement of EGF or heregulin-triggered mitogenic (ERK1/2) and survival (AKT) pathways, thereby enhancing growth potential under low-serum or normal conditions and resistance to the induction of cell death by different therapeutic agents Moreover, GRK2 upregulation markedly favors anchorage-independent growth of luminal MCF7 or MDA-MB-231 basal cancer cells and increases their competence to trigger tumor growth in vivo (Nogués et al., 2016). Conversely, decreasing GRK2 levels have the opposite effect in both luminal and basal breast cancer cells (Zhang et al., 2014; Nogués et al., 2016) and sensitize breast cancer cells to chemotherapeutic agents. Activation of the HDAC6-Pin1 axis appears to underlie the positive effects of GRK2 on oncogenic hallmarks. Increased GRK2 fosters the phosphorylation and activation of HDAC6, leading to deacetylation of the prolyl isomerase Pin1, a central modulator of tumor progression, thereby enhancing its stability and functional interaction with key mitotic regulators (Fig. 3). A correlation between GRK2 expression and Pin1 levels and deacetylation status is noted in both cell models and in breast cancer patients (Nogués et al., 2016). 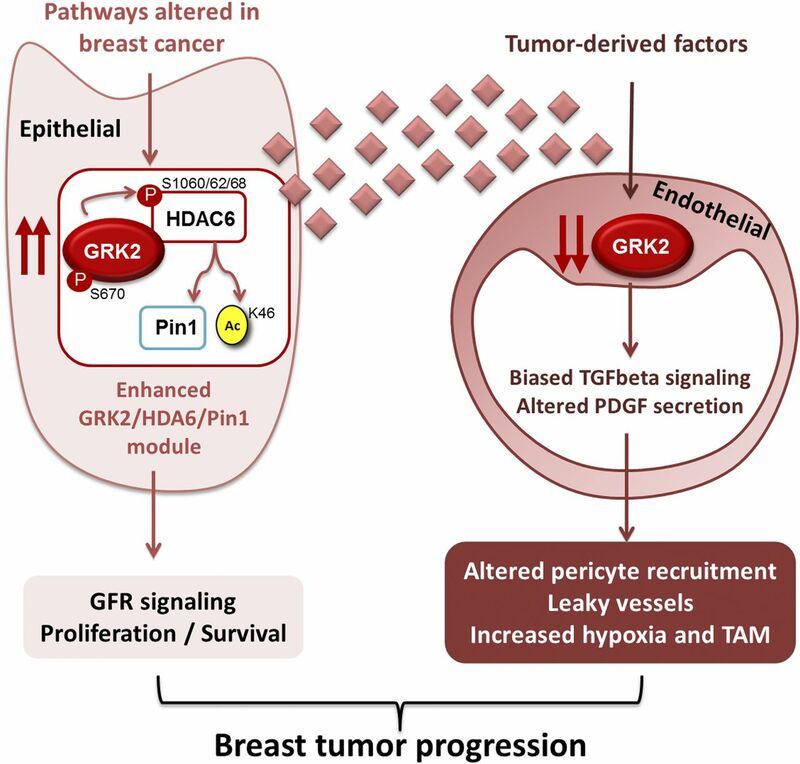 Molecular mechanisms involved in the role of GRK2 in breast tumorigenesis. Enhanced activity of different tumor-promoting cascades in breast cancer converges in promoting the upregulation of GRK2, HDAC6, and Pin1, as well as in increasing phosphorylation of GRK2 on S670. The switch-on of the GRK2-HDAC6-Pin1 signaling module would contribute to perpetuate cell proliferation and increased survival. See text for details. In sum, GRK2 upregulation emerges as a convergent feature of the stimulation of diverse pathways altered in luminal breast cancer, in parallel to that of other key proteins such as HDAC6 or Pin1, known to be overexpressed in these tumoral contexts (Lee et al., 2008; Li et al., 2013; Zhou and Lu, 2016). 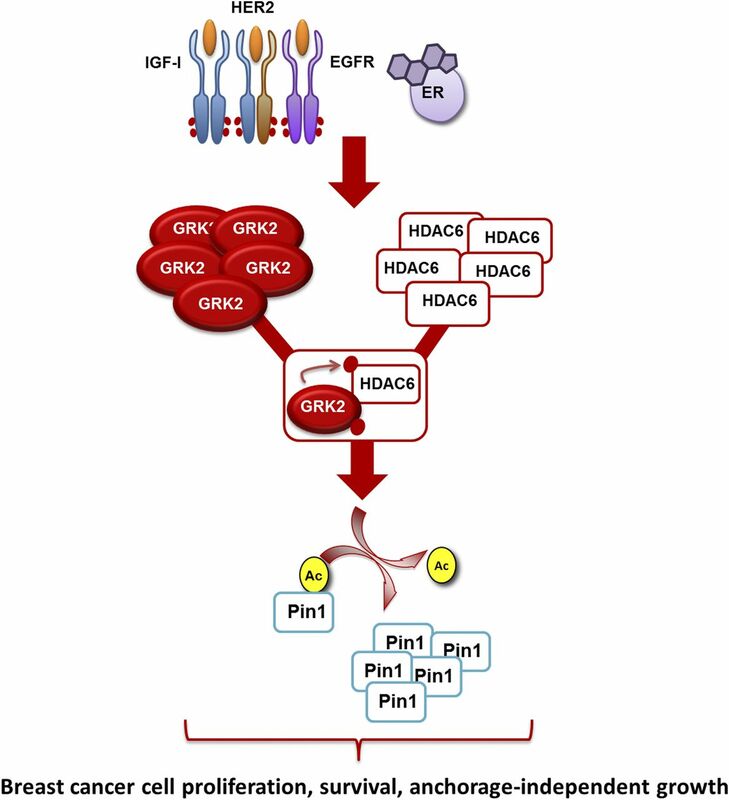 In such situations, as well as in settings of increased phosphorylation of GRK2 on S670 by means of hyperactivation of ERK1/2 (often found in both luminal and basal breast cancer contexts), the switch-on of the GRK2-HDAC6-Pin1 signaling module would help to perpetuate cell proliferation and increased survival. It is tempting to suggest that the GRK2-HDAC6-Pin1 molecular signature in breast tumorigenesis might be used as a potential target for combination therapies. Although targeting growth factors or estrogen receptors has improved the treatment of certain subtypes of breast cancer, the emergence of resistances is an important drawback. Partial responses to pan-HDAC inhibitors have been shown (Tate et al., 2012) in GRK2-overexpressing cells, whereas extra GRK2 levels lessen the cytotoxic effectiveness of HDAC6 inhibitors (Nogués et al., 2016). Moreover, increased GRK2 levels would favor downmodulation of wild-type p53 protein and extra activation of the prosurvival AKT route, helping to counteract the effects of cytotoxic compounds. These results are consistent with the occurrence of an inverse GRK2-p53 correlation in xenograft tumor models and in tumors of patients with breast cancer (Nogués et al., 2016). Therefore, treatment of certain types of breast cancer may benefit from the combined use of GRK2, HDAC6, or Pin1 (Zhou and Lu, 2016) inhibitors. 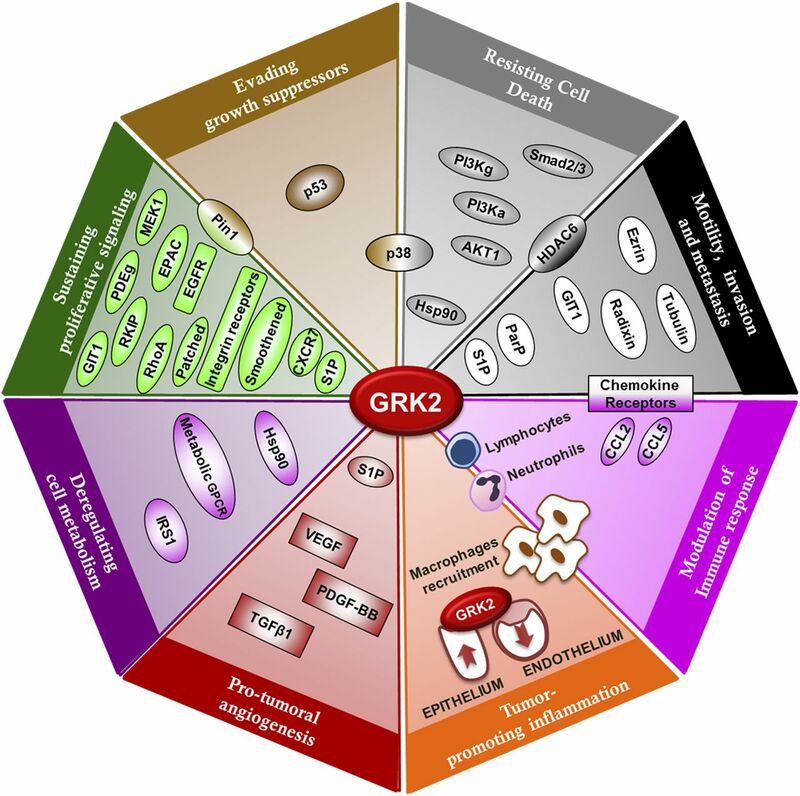 Tumor-Type–Specific Roles of GRK2 in Cancer Progression. It is worth noting that changes in GRK2 levels and the overall impact of altered GRK2 expression on specific tumors might differ. Contrary to breast cancer cells, GRK2 appears to play an inhibitory role in IGF1-induced HCC proliferation and migration. Overexpression of GRK2 decreases early growth response-1 (EGR1) expression, whereas GRK2 silencing increases EGR1 expression (Ma et al., 2016) and the MAPK pathway (Fu et al., 2013); however, no information was provided in these reports on the expression levels of the kinase in primary HCC tissues. Similarly, it has been reported that a GRK2-specific peptide inhibitor increased tumor mass upon xenograft transplantation of HEK293 cells (Fu et al., 2013). Regarding pancreatic cancer, the GRK2/ADRBK1 gene was identified as a relevant target using a high-content screening approach (Bucholz et al., 2015). RNAi-mediated knockdown of GRK2 significantly inhibited growth through induction of a G1/S cell-cycle arrest, consistent with the notion that enhanced GRK2 fosters cancer progression. Analysis of tissue microarrays confirmed that GRK2 protein was undetectable in non-neoplastic tissues (chronic pancreatitis and normal pancreas), whereas readily detectable in 51% of pancreatic ductal adenocarcinoma samples in both epithelial cancer cells, as well as subsets of infiltrating immune cells. Another group has also suggested that GRK2 is overexpressed in pancreatic cancer and might serve as potential indicator of unfavorable prognosis (Zhou et al., 2016). On the other hand, downmodulation of GRK2 has been reported in Kaposi sarcoma (Hu et al., 2015), leading to enhanced migration in endothelial cells, and in a subset of prostate cancers with high grades of malignancy (Prowatke et al., 2007); however, another group has shown that expression of the c-terminal region of GRK2 strongly inhibited growth of prostate cancer cells in vitro and in vivo, although whether this effect was specific or due to blocking Gβγ signaling was not determined (Bookout et al., 2003). In sum, the fact that GRK2 is functionally related to the key hallmarks of cancer and the emerging evidence obtained in several tumors put forward this protein as an oncomodifier that is able to contribute to cancer progression in different ways, depending on the specific tumor and cell types. Future research will help to characterize potentially altered GRK2 levels or function in different tumor types at different stages of progression to better understand how oncogenic drivers and/or the tumor microenvironment can promote changes in GRK2 expression and functionality and to uncover the molecular mechanisms by which such changes cooperate in tumor proliferation or metastasis. In addition to transformed cells, these investigations should also include the other cell types (endothelial, fibroblasts, immune) present in the tumor microenvironment. As exemplified by the available data on breast tumorigenesis, simultaneous and opposed alterations of GRK2 in the epithelial (upregulation) (Nogués et al., 2016) and stromal (downmodulation) components of breast tumors (Rivas et al., 2013) might act synergistically to promote tumor growth (Fig. 4). A more accurate understanding of the mechanisms underlying such tumor- and cell type–specific regulation of GRK2 levels and functionality and of its impact in signaling networks and cellular functions will help to gain further insight on its integrated role in cancer development and to design future therapeutic strategies. Physiologic integration of cell-type–specific GRK2 effects in breast cancer tumorigenesis. Concurrent and opposite changes in GRK2 expression taking place in epithelial and endothelial components of breast tumors might act synergistically to promote tumor growth. The authors thank Drs. Cristina Murga and Catalina Ribas for critical reading of the manuscript. Wrote or contributed to the writing of the manuscript: Nogués, Reglero, Rivas, Neves, Penela, Mayor. Our laboratory is funded by grants from Ministerio de Economía y Competitividad of Spain (SAF2014-55511R), the European Union (H2020-MSCA Programme, Grant agreement 64183-ONCORNET), the CIBER-Cardiovascular Network of Instituto Carlos III (CB16/11/00278) to F.M., and Instituto de Salud Carlos III (PI14-00435,PIE-13-00041) to P.P, and Fundación Ramón Areces to our institution. (2011) The role of HDAC6 in cancer. J Biomed Biotechnol 2011:875824. (2011) GRK2-dependent S1PR1 desensitization is required for lymphocytes to overcome their attraction to blood. Science 333:1898–1903. (2004) Stromal fibroblasts in cancer initiation and progression. Nature 432:332–337. (2000) Reduced G-protein-coupled-receptor kinase 2 activity results in impairment of osteoblast function. Bone 27:367–373. (2003) Targeting Gbetagamma signaling to inhibit prostate tumor formation and growth. J Biol Chem 278:37569–37573. (2016) Myocardial pathology induced by aldosterone is dependent on non-canonical activities of G protein-coupled receptor kinases. Nat Commun 7:10877. (2005) G protein-coupled receptor kinase 2-mediated phosphorylation of ezrin is required for G protein-coupled receptor-dependent reorganization of the actin cytoskeleton. Mol Biol Cell 16:3088–3099. (2013) Prodeath signaling of G protein-coupled receptor kinase 2 in cardiac myocytes after ischemic stress occurs via extracellular signal-regulated kinase-dependent heat shock protein 90-mediated mitochondrial targeting. Circ Res 112:1121–1134. (2011) G protein-coupled receptor kinase 2 activity impairs cardiac glucose uptake and promotes insulin resistance after myocardial ischemia. Circulation 123:1953–1962. (2012) GRK2 at the control shaft of cellular metabolism. Curr Pharm Des 18:121–127. (2012) Raf kinase inhibitor protein (RKIP) dimer formation controls its target switch from Raf1 to G protein-coupled receptor kinase (GRK) 2. J Biol Chem 287:23407–23417. (2008) Specific activity of class II histone deacetylases in human breast cancer cells. Mol Cancer Res 6:1908–1919. (2000) Agonist-dependent modulation of G protein-coupled receptor kinase 2 by mitogen-activated protein kinases. Mol Pharmacol 57:778–783. (2003) MAPK-dependent degradation of G protein-coupled receptor kinase 2. J Biol Chem 278:29164–29173. (2012) Molecular biology in breast cancer: intrinsic subtypes and signaling pathways. Cancer Treat Rev 38:698–707. (2012) GRK2: multiple roles beyond G protein-coupled receptor desensitization. Trends Pharmacol Sci 33:154–164. (2008) Association of the membrane estrogen receptor, GPR30, with breast tumor metastasis and transactivation of the epidermal growth factor receptor. Steroids 73:870–873. (2013) Inhibition of G-protein-coupled receptor kinase 2 (GRK2) triggers the growth-promoting mitogen-activated protein kinase (MAPK) pathway. J Biol Chem 288:7738–7755. (2012) Mitochondrial localization unveils a novel role for GRK2 in organelle biogenesis. Cell Signal 24:468–475. (2010) G protein-coupled receptor kinase 2 plays a relevant role in insulin resistance and obesity. Diabetes 59:2407–2417. (2012) G protein-coupled receptor kinases: more than just kinases and not only for GPCRs. Pharmacol Ther 133:40–69. (2011) Hallmarks of cancer: the next generation. Cell 144:646–674. (2007) Novel dominant negative Smad antagonists to TGFbeta signaling. Cell Signal 19:1565–1574. (2005) The G protein-coupled receptor kinase-2 is a TGFbeta-inducible antagonist of TGFbeta signal transduction. EMBO J 24:3247–3258. (2006) The multifunctional GIT family of proteins. J Cell Sci 119:1469–1475. (2016) Endothelin-1 suppresses insulin-stimulated Akt phosphorylation and glucose uptake via GPCR kinase 2 in skeletal muscle cells. Br J Pharmacol 173:1018–1032. (2015) A KSHV microRNA directly targets G protein-coupled receptor kinase 2 to promote the migration and invasion of endothelial cells by inducing CXCR2 and activating AKT signaling. PLoS Pathog 11:e1005171. (2016) The expanding GRK interactome: implications in cardiovascular disease and potential for therapeutic development. Pharmacol Res 110:52–64. (2009) Kinase activity-independent regulation of cyclin pathway by GRK2 is essential for zebrafish early development. Proc Natl Acad Sci USA 106:10183–10188. (2010) G protein-coupled receptor kinase 2 activates radixin, regulating membrane protrusion and motility in epithelial cells. Biochim Biophys Acta 1803:300–310. (2003) Differential expression of GRK isoforms in nonmalignant and malignant human granulosa cells. Endocrine 22:135–142. (2016) Cancer, obesity, diabetes, and antidiabetic drugs: is the fog clearing? Nat Rev Clin Oncol. DOI: 10.1038/nrclinonc.2016.120 [published ahead of print]. (2012) A novel GRK2/HDAC6 interaction modulates cell spreading and motility. EMBO J 31:856–869. (2008) The cytoplasmic deacetylase HDAC6 is required for efficient oncogenic tumorigenesis. Cancer Res 68:7561–7569. (2016) Metabolic plasticity as a determinant of tumor growth and metastasis. Cancer Res 76:5201–5208. (2013) Histone deacetylase 6 plays a role as a distinct regulator of diverse cellular processes. FEBS J 280:775–793. (2013) Grk2 is an essential regulator of CXCR7 signalling in astrocytes. Cell Mol Neurobiol 33:111–118. (2005) A crucial role for GRK2 in regulation of endothelial cell nitric oxide synthase function in portal hypertension. Nat Med 11:952–958. (2013) TLR4 signaling augments monocyte chemotaxis by regulating G protein-coupled receptor kinase 2 translocation. J Immunol 191:857–864. (2002) Oxidative stress decreases G protein-coupled receptor kinase 2 in lymphocytes via a calpain-dependent mechanism. Mol Pharmacol 62:379–388. (2014) Downregulation of G protein-coupled receptor kinase 2 levels enhances cardiac insulin sensitivity and switches on cardioprotective gene expression patterns. Biochim Biophys Acta Mol Basis Dis 1842:2448–2456. (2006) Smoothened signal transduction is promoted by G protein-coupled receptor kinase 2. Mol Cell Biol 26:7550–7560. (2008) Immunohistochemical detection, regulation and antiproliferative function of G-protein-coupled receptor kinase 2 in thyroid carcinomas. J Endocrinol 198:101–110. (2002) Expression and activity of g protein-coupled receptor kinases in differentiated thyroid carcinoma. J Clin Endocrinol Metab 87:3279–3286. (2016) G protein-coupled receptor kinase 2 (GRK2) promotes breast tumorigenesis through a HDAC6-Pin1 axis. EBioMedicine 13:132–145. (2011) Multiple scaffolding functions of beta-arrestins in the degradation of G protein-coupled receptor kinase 2. J Biol Chem 286:1165–1173. (2014) Novel insights into G protein and G protein-coupled receptor signaling in cancer. Curr Opin Cell Biol 27:126–135. (2013) Hematopoietic G-protein-coupled receptor kinase 2 deficiency decreases atherosclerotic lesion formation in LDL receptor-knockout mice. FASEB J 27:265–276. (2001) Beta-arrestin- and c-Src-dependent degradation of G-protein-coupled receptor kinase 2. EMBO J 20:5129–5138. (2012) Roles of GRK2 in cell signaling beyond GPCR desensitization: GRK2-HDAC6 interaction modulates cell spreading and motility. Sci Signal 5:pt3. (2010a) The complex G protein-coupled receptor kinase 2 (GRK2) interactome unveils new physiopathological targets. Br J Pharmacol 160:821–832. (2014) Role of G protein-coupled receptor kinases in cell migration. Curr Opin Cell Biol 27:10–17. (2008) G protein-coupled receptor kinase 2 positively regulates epithelial cell migration. EMBO J 27:1206–1218. (2010b) G protein-coupled receptor kinase 2 (GRK2) modulation and cell cycle progression. Proc Natl Acad Sci USA 107:1118–1123. (1998) Degradation of the G protein-coupled receptor kinase 2 by the proteasome pathway. J Biol Chem 273:35238–35244. (2000) Overexpression of G protein-coupled receptor kinase-2 in smooth muscle cells attenuates mitogenic signaling via G protein-coupled and platelet-derived growth factor receptors. Circulation 102:793–799. (2006) Phosphorylation of p38 by GRK2 at the docking groove unveils a novel mechanism for inactivating p38MAPK. Curr Biol 16:2042–2047. (2007) Dynamic regulation of phosphoinositide 3-kinase-gamma activity and beta-adrenergic receptor trafficking in end-stage human heart failure. Circulation 116:2571–2579. (2011) Basic and therapeutic aspects of angiogenesis. Cell 146:873–887. (2007) Expression analysis of imbalanced genes in prostate carcinoma using tissue microarrays. Br J Cancer 96:82–88. (2007) The G protein-coupled receptor kinase (GRK) interactome: role of GRKs in GPCR regulation and signaling. Biochim Biophys Acta 1768:913–922. (2013) Developmental and tumoral vascularization is regulated by G protein-coupled receptor kinase 2. J Clin Invest 123:4714–4730. (2014) Role of G protein-coupled receptor kinase 2 in tumoral angiogenesis. Mol Cell Oncol 1:e969166. (2013) G protein-coupled receptor kinase 2 (GRK2) is a Rho-activated scaffold protein for the ERK MAP kinase cascade. Cell Signal 25:2831–2839. (2006) Mdm2 is involved in the ubiquitination and degradation of G-protein-coupled receptor kinase 2. EMBO J 25:4752–4762. (1999) Agonist-dependent phosphorylation of the G protein-coupled receptor kinase 2 (GRK2) by Src tyrosine kinase. J Biol Chem 274:34411–34416. (2015) GRK2 compromises cardiomyocyte mitochondrial function by diminishing fatty acid-mediated oxygen consumption and increasing superoxide levels. J Mol Cell Cardiol 89 (Pt B):360–364. (2011) β-Arrestin-mediated receptor trafficking and signal transduction. Trends Pharmacol Sci 32:521–533 Elsevier Ltd.
(2016) Critical role for Epac1 in inflammatory pain controlled by GRK2-mediated phosphorylation of Epac1. Proc Natl Acad Sci USA 113:3036–3041. (2010) Identification of the Rac-GEF P-Rex1 as an essential mediator of ErbB signaling in breast cancer. Mol Cell 40:877–892. (2012) Targeting triple-negative breast cancer cells with the histone deacetylase inhibitor panobinostat. Breast Cancer Res 14:R79. (2004) GRK2 is an endogenous protein inhibitor of the insulin signaling pathway for glucose transport stimulation. EMBO J 23:2821–2829. F, andMurga C (2015) Reversal of diet-induced obesity and insulin resistance by inducible genetic ablation of GRK2. Sci Signal 8:ra73. (2012) GRK2 contribution to the regulation of energy expenditure and brown fat function. FASEB J 26:3503–3514. (2006) GRKs and arrestins: regulators of migration and inflammation. J Leukoc Biol 80:1214–1221. (2003) The inhibitory gamma subunit of the type 6 retinal cGMP phosphodiesterase functions to link c-Src and G-protein-coupled receptor kinase 2 in a signaling unit that regulates p42/p44 mitogen-activated protein kinase by epidermal growth factor. J Biol Chem 278:18658–18663. (2013) GRK2 negatively regulates IGF-1R signaling pathway and cyclins’ expression in HepG2 cells. J Cell Physiol 228:1897–1901. , S.W.A H, Wu J, Shi X, Liu X, and Kim S (2014) si-RNA-mediated silencing of ADRBK1 gene attenuates breast cancer cell proliferation. Cancer Biother Radiopharm 29:303–309. (2016) An essential role for Grk 2 in Hedgehog signalling downstream of Smoothened. EMBO Rep 17:739–752. (2012) Selective recruitment of G protein-coupled receptor kinases (GRKs) controls signaling of the insulin-like growth factor 1 receptor. Proc Natl Acad Sci USA 109:7055–7060. (2016) G-protein-coupled receptor kinase 2 in pancreatic cancer: clinicopathologic and prognostic significance. Hum Pathol 56:171–177. (2016) The isomerase PIN1 controls numerous cancer-driving pathways and is a unique drug target. Nat Rev Cancer 16:463–478.